Pictured is a virtual reality model of a silver snuffbox that was presented to a ship's captain in 1854, and is part of the National Museum of Australia's collection. As people touch, open and explore the silver box inside the virtual space, the story unravels. There is a ship 'inside', a map of the voyage, and the names of the passengers. CSIRO's haptic workbench is a bench-sized virtual environment that allows you to see, feel and manipulate three-dimensional virtual objects using touch-sensitive tools. 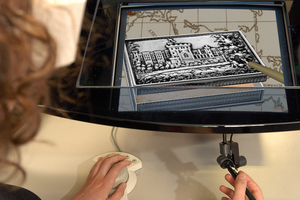 The virtual reality medium allows a museum visitor to touch a valuable object that would normally be kept behind glass, and allows magical special effects that could not be achieved with real objects.